Orthopedic-Implants.net is a new initiative of D4 Surgicals of India one of the leading suppliers and exporters of Hospital Furniture from India. With years of experience and professional approach, it has now ventured into the business of manufacturing and exports of high quality Orthopedic Implant and Orthopaedic Instruments at affordable prices. 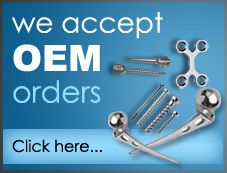 Our Ortho Implants and Instruments sets quality are reasonable and not cheap. We are one of the best sources to buy any Orthopedic Implants or Instrument sets from India.